How much risk will we accept for electronic convenience? It’s often claimed that a late-Victorian commissioner of patents said that his office should be shut down, on the grounds that "Everything that can be invented has been invented." If this ever was said with a straight face, it’s hard to think of a prediction more spectacularly wrong: the pace of wonders and their accompanying hoopla seems to be accelerating drastically, not only since then, but even since the beginning of this occasional discussion on new technology in the pages of Scragged. The photo is a view of the world’s largest battery at its location in the Australian Outback, where it is proudly the wager-winning object of a risky challenge. It was constructed in record time to meet the demands of a braggadocious pledge from its technical father. 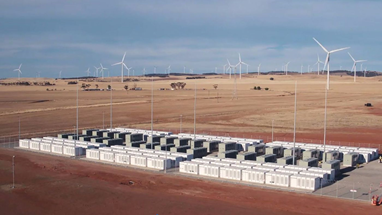 Elon Musk’s ‘World’s Largest Battery’ is the prize-winner that he presented to the energy company in Jamestown, Australia. It is a rechargeable Li-Ion battery of enormous storage capacity - an example of the capability that we have come to expect from our electronics. Miracles never cease, but appreciation for them ebbs rapidly. Although Musk’s battery was the big news in November, the latest battery news is less than sterling: an aircraft overhead luggage compartment battery fire. 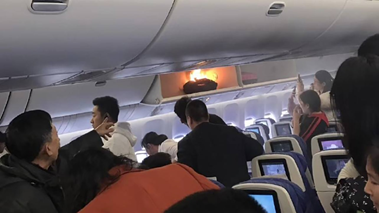 Last week brought a report about a flight overseas on which, while the plane was boarding, and before it had pushed away from the gate, a piece of luggage in the upper luggage compartment burst into flame. The conflagration was caught on camera by a nearby passenger. Aesthetics aside, a flaming object in an overhead bin of a passenger cabin is an unsettling event: the very first thought to pop into one’s mind is that selfsame flaming battery occurring 45 minutes later when the aircraft is at 35,000 feet over the Pacific Ocean. Instead of a mild annoyance, the passengers and crew would have been faced with a potential mass casualty incident, an emergency of major proportions. There have been stories floating around for years about Li-Ion batteries and their propensity for bursting into flames, but considering how many batteries there are, such tales were few and far between as we marched through the early days of this highly desirable battery type. Now, however, there is a whole industry (Chinese, of course) whose existence is contingent upon lowest-bidder electronic parts, safety not always being included. That attitude is pervasive in societies where shoddy merchandise is acceptable, but where the Western ethos prevails, there is an increasing intolerance for that kind of performance. A couple of years ago there was a spate of Tesla fires, and it was determined that the frequency was approximately 1 in 10,000, or 0.01% - the equivalent statistic for gasoline powered cars is 1 in 1300. By historical standard, this is an infinitesimally small percentage - but the battery maker bear the burden of convincing his customers that this rate of failure is acceptable. There are many things that can fail as frequently without causing serious heartburn to consumers. But a battery fire in high-speed urban traffic or on board a passenger aircraft at 35,000 feet is not something that can be passed off as a trivial annoyance. Tesla and others must weigh the advantages of Li-Ion carefully as they seek a means of eliminating the fire hazard. Failure rates of batteries in state-of-the-art Teslas are one thing, but failure rates in batteries for less meticulous Chinese manufacturers must be evaluated on an entirely different scale. There has not been a Li-Ion battery fire that claimed a human life so far. It is bound to happen someday though, and we can only hope that such a fire will not be responsible for multiple deaths as would a fire in an airborne aircraft. Gasoline-powered cars have approximately 10 times as many fires as cars with lithium batteries; Jet-A powered airplanes have spontaneous fires next to never. Li-Ion batteries contain lithium, obviously, as one of the materials that store the electrical power. Lithium is the lightest metal, and thus produces the lightest and most powerful rechargeable storage batteries. For cell phones and other compact portable electronics, they are the best battery going: they are smaller, lighter, and much more adaptable than older designs. They are available in the same two types as older design types: primary and secondary. Primary batteries get their charge from the chemical composition of the cell, and when the chemicals lose their potency, the battery is dead and may not be rejuvenated. In flashlight batteries, these are the baseline power cell, and are the low end of the battery world. Lithium batteries of the primary type are much longer lasting than traditionally constructed batteries, although any primary battery just says sayonara when it is drained. Rechargeable batteries are the secondary type. Li-Ion secondary batteries are available in voltages ranging from 1.5 V – the same as traditional ones – to 3.7 V for some types of Li-Ion cells. Those big batteries that we see in laptop computers are Li-Ion batteries of varying output voltages and current ratings. The voltages range up to 18 V or more by arranging the cells in various combinations of series and parallel electrical connections. Most Li-Ion batteries of that sort are rechargeable. The problem seems to be that as Li-Ion batteries, especially in configurations for laptops and cell phones, gain in popularity, the batteries are being manufactured by providers who do not have the same regard for human safety as we find in the US. Knock off brands produced by these folks are suspect. With traditional battery types, that simply lead to dollar-store batteries that quickly but harmlessly die; the failure of a Li-Ion cell is far more dramatic and deadly. One likely cause of the problems is allowing contaminants in the batteries, by the presence of tiny pieces of trash permitted into ‘clean-room’ environments by poorly maintained filter systems. The level of cleanliness required is difficult to achieve even by first world manufacturers, and the least bit of laxness in cleanliness standards is enough to cause microscopic trash to get into the clean room environment. The insulating medium in the batteries for laptops and cell phones gets very thin as the manufacturers try to cram more battery into less space. These ultra-thin membranes are easy to puncture as they are assembled, and the resulting internal shorts are the reasons for the fires. As we develop more sophisticated electronics, battery sizes will continue to shrink, and power demands will grow as customers demand bigger screens, more memory, and more functions. Safety will be a growing challenge for manufacturers of Li-Ion batteries. In transportation, there’s a bright side: a battery fire is far less dangerous and far less frequent than the gasoline-powered car fires of the past. But added safety in your car is cold comfort when your laptop bursts into flame in your lap, over the Pacific. Voltage has nothing to do with it. Peak current combined with natural shorting mechanisms are the problem. Voltage doesn't generate heat. Current does. "because they are capable of developing voltages double or even more compared to what we’re used to with traditional battery construction." I stopped reading here. The author is bull sitting, xe know ish about batteries AND does not want to learn. Citing the voltage as being the cause of the fires is indeed erroneous. The article has been corrected. The actual cause, as the article does explain, seems to be problems in the manufacturing process.